Oh, Plastiksack! is an exhibition currently at the Gewerbemuseum in Switzerland. 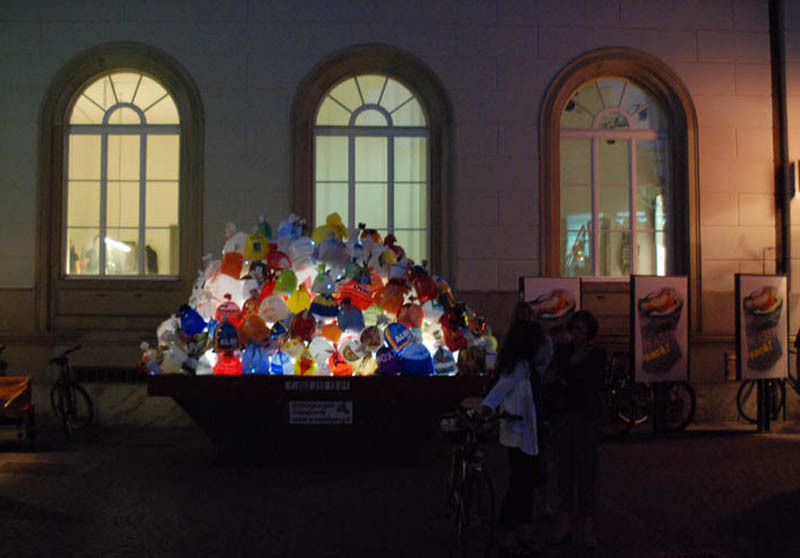 A tribute to, and a commentary on, the ubiquitous plastic bag; from trash to status symbol, as well as a reflection of consumption patterns, the plastic bag is represented as the medium of choice and running theme for all the sculptures, installations, paintings, products and photographs in the show. Luzinterruptus (lit dumpster); Simon Monk (Batman and Robin in plastic bags paintings); Ida-Marie Corell (Ikea bag installation and dress); Duty Free bag collection (artist? ); Claudia Borgna (plastic bag installation in courtyard); Living room furniture made from plastic bags by Anne-Cecile Rappa, Biaugust and Ryan Frank; Luke Julius Keijser (tailored suits); and Nils Völker (plastic bag installation Eighty Eight). The exhibit runs through June 21, 2012. Photos: Gewerbemuseum, Claudia Borgna, Ida-Marie Corell, Bernhard Hageman; Tommi Makynen. This entry was posted in Art, Event, Fun, Graphic Design, Industrial Design, Pop Culture. Bookmark the permalink. 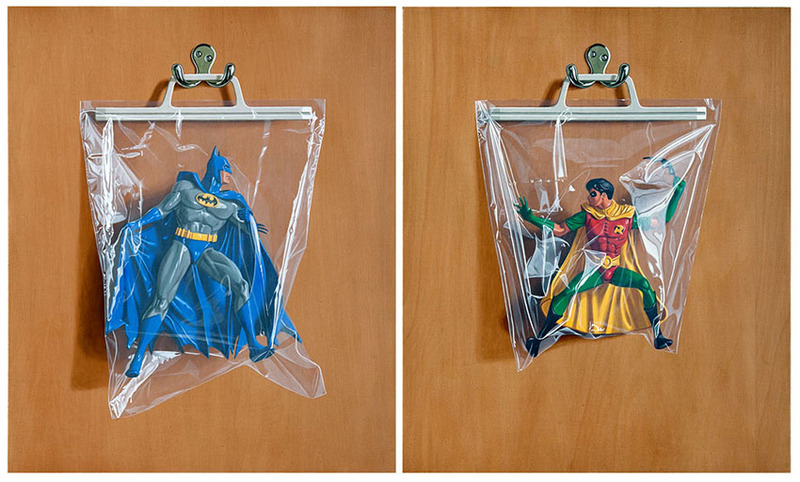 Reblogged this on PLASTIC BAG BLOG. The fabulous site inhabitat featured now Ida-Marie Corell’s Ikea gown, the centerpiece of her installation in a show called “Oh, Plastiksack” at the Gewerbemuseum in Winterthur, Switzerland. 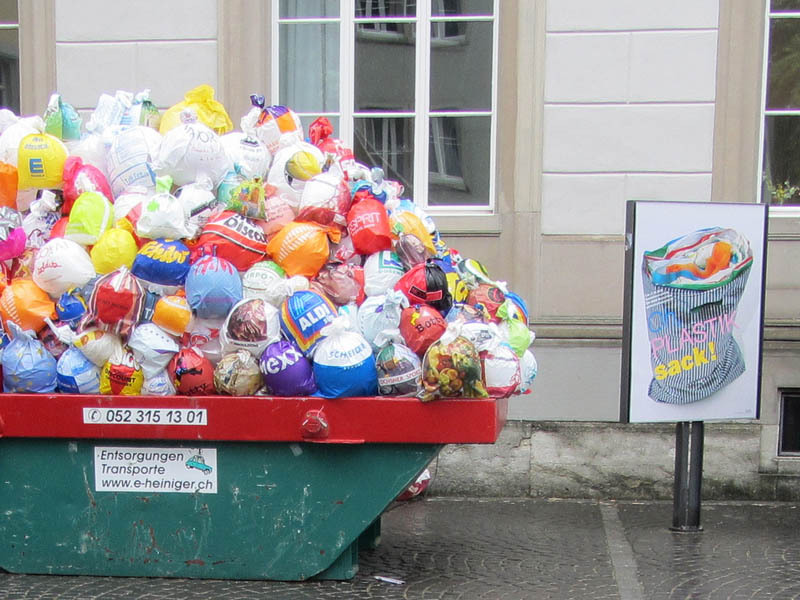 In trying to learn more about both the artist and the display, I came across Corell’s fantastic Plastic Bag Site, which I will soon be contributing to the blogroll and trolling for content on the routine from now on.